I was looking on LLL Reptile and they had 4 different brands of Mercury Vapor bulbs and was wondering which one was best, Zoo Med's Powersun UV, Exo Terra's Solar Glo, T-Rex's UV Heat, and Fluker's Sun Spot? I heard that the T-Rex version was just small enough to fit in standard size lamp? 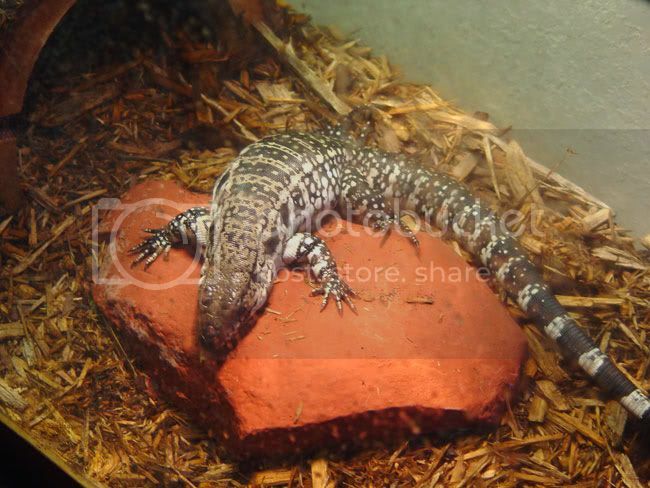 I already have 2 standard size lamps and I would like to put one of the Mercury Vapors and a 100 watt infrared bulb in them for the 40 gallon I have for my future B&W Tegu? Which do you guys recommend? P.S. I have heard Heat Rocks are dangerous but want to get the expert's( Bobby Hill's )opinion? I used the 100W T-Rex MVB's in a 20G long and a 30G breeder, both 12" high. That gave the perfect basking temp in a 70 degree room. The 100W T-Rex bulb would probably work well in a 40G breeder if you upped the room temp to 75 or 80 degrees. There isn't much room on top of the tank to add another big dome for additional heat. I'd recommend building a paver/concrete block basking platform 4" to 6" high to get him closer to the bulb and he should be fine. Always check you're surface basking tamps with a Temp-Gun, never guess! I like the T-Rex one too. That's what Lucky has. what about the sunforce MVB that big apple sells? I just think its just weird. I Know that Bobby is a fan of powersun but i would to know that he tried all the others also so he know its the best out of all of them. Can i get you guys to all post your favorite MVB for so i can get a majority? Based on UVB output and decay rate and warranty Megaray are the winner. I don't think the Big Apple ones have been tested since they changed designs. I think im gonna go with the t-rex. Are heat rocks safe enough for tegus? Are heat rocks safe enough for tegus? Heat rocks are dangerous!! They can have hot spot s that can burn. Don't waste your money. Put a concrete block under the basking spot and it will heat up and provide belly warmth. Just be sure the surface temp doesn't exceed 110 degrees. Yeah I was going to say that too! Heat rocks ARE NO GOOD! I don't know why they even sell them! They sell them for the same reason they sell calcisand etc. new keepers with the wrong or no information will buy them, it's all about the $. Thanks . just wanted to get the heat rock thing cleared because i thought they were dangeros but wanted to hear other opinion's. Wher exactly is the so called superb Mega Ray bulb sold on the internet? :nono Now, now! Hot rocks are perfectly fine to use for whatever animal you like. See Belle getting use of her modified hot rock under her MegaRay MVB. For my money, I wouldn't use any other MVB but MegaRay but the only other one I might even consider is a PowerSun. Do your research and make an informed decision for yourself. I've read the T-Rex bulbs are the pet store version of the Mega-Ray. Don't have any proof. What do you mean by pet store version of the Megaray? Sounds like to me he means they're the same bulb made by the same company yet one is distributed by someone else...and is more expensive. That sounds plausible but they have vastly different test results. I still wouldn't doubt they are made by the same manufacturer though. Megaray tests higher, and lasts longer with a drastically different decay rate, claiming only a 30% drop off during the entire LIFE of the bulb. (which even after 18 months of use is still better than most brand new) They are also cheaper at $46 + $10 shipping vs $70+ for a Powersun in the nearest chain pet store. I see NO reason to use anything but Megaray which, according to experts with solar meters, is the best. To the OP, Look for yourself. Could be made by the same ppl but the bulb design is totally different which is why the output and decay rate are different. The Megaray bulbs are made by Westron, I'm betting the Others use cheaper manufacturers since I know it took Bob a long time to convince Westron to produce for him.